Found 4 file extension associations related to Ulead Photo Explorer and 4 file formats developed specifically for use with Ulead Photo Explorer. Ulead Photo Explorer lets you spend more time enjoying photos, music and videos and less time finding them. It’s the all-in-one solution for owners of digital cameras, camcorders, scanners or anyone who wants to make it easier to keep track of their media. Easily collect and add images, video or music clips into a central album for easier access and photo management. Opens your photos using a fullscreen viewer so that you can see photos in full detail. Repair common photo problems automatically using Auto Level, Adjust, Color and Contrast. Trim video clips to remove unwanted segments from videos or commercials from recorded TV shows. Print full-sized images, image thumbnails, greeting cards and calendars in various sizes and layouts. Create slideshows that include photos, video, music, narration, captions and transition effects and share them by CD and DVD, e-mail, the Web and more. 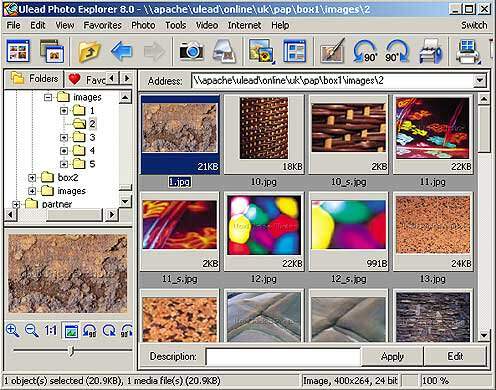 The Ulead Photo Explorer software seems to be old or discontinued. If you need more information please contact the developers of Ulead Photo Explorer (Corel Corporation), or check out their product website.